Rogelio is currently the Cat Warehouse Manager and must make sure to keep all of the other cats in the warehouse busy! He leads a crew of 4 and manages our 45,000 square foot warehouse facility. He's been working at OSI for over 4 years. 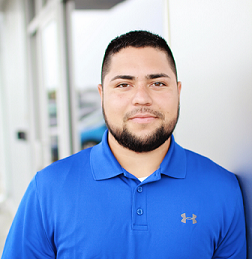 He's bilingual, has developed strong leadership skills, Inventory Control, Replenishment, and Cycle counts. He communicates with multiple carriers to receive or schedule pickups as well as executing the planning, staging and safety of all the goods being shipped and received. Rogelio is currently attending Northwest Arkansas Community College to earn his Associate Degree in Applied Science- Business Management-Logistics Management.